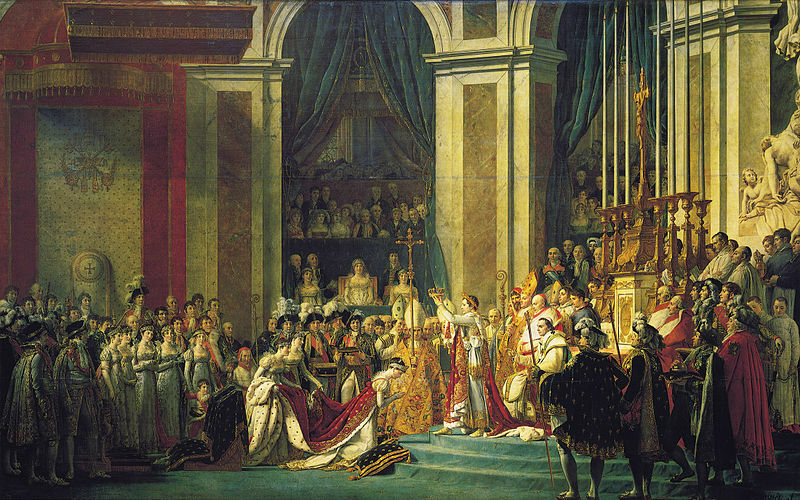 historical event: The emperor and empress were first anointed, and then the pope was supposed to crown Napoleon. 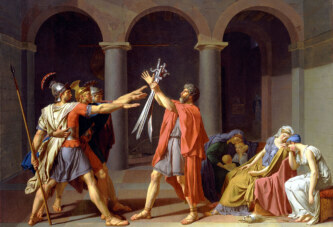 However, at that moment, Bonaparte took the crown and placed it on his head. On this day the solemn coronation of Napoleon as Emperor of the French took place. It was performed in the Cathedral of Notre-Dame, in the presence of Pope Pius VII and several thousand people. It is interesting that the French people voted in a referendum to declare Napoleon emperor. The motive for this was the prestige that the imperial title had in Europe, among countries that were almost all monarchies. The imperial ornate (crown, scepter, sword) was carefully prepared for the coronation. For example, the emperor’s coronation mantle, made from velvet, weighed almost 40 kg, and it was supported by four of the emperor’s companions. The emperor and empress were first anointed, and then the pope was supposed to crown Napoleon. However, at that moment, Bonaparte took the crown and placed it on his head, and then he crowned the Empress Josephine.